The combined number of passenger planes operated by South Korea’s six low-cost carriers extended to 140 airplanes last year, challenging the 167 airplanes owned by the national flag carrier Korean Air Lines, the government said. The six LCCs -- Jeju Air, Jin Air, Air Busan, Air Seoul, Eastar Jet and T’way Air -- have aggressively expanded their fleet to meet growing travel demand on short-haul routes to Asian cities. 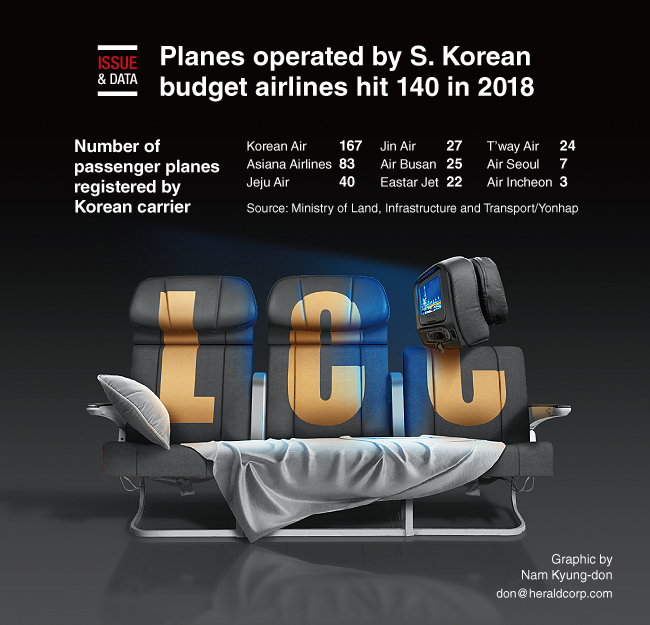 The budget carriers and two full-service carriers -- Korean Air and Asiana Airlines -- as well as operators of private and public planes, had a total of 835 aircraft in service, up 5.4 percent from 2017, the Ministry of Land, Infrastructure and Transport said in a statement.